"Remind your school system to turn off bus engines when buses are parked. Exhaust from idling school buses can pollute air in and around the bus, and can enter school buildings through air intakes, doors, and open windows. Constant idling also wastes fuel and money, and school bus engines really need only a few minutes to warm up." Wednesday, Aug 22, 10:00 am to noon. Join collections and grounds manager Tom Clark for this informative and fun walking tour of the many glorious mature trees of Edgartown. In the midst of the mantle of green that envelops downtown Edgartown, the hydrangeas and picket fences, many unique and fine specimen trees await discovery. Expect the famous Pagoda Tree and so much more. Call 508-693-9426 to pre-register and for carpool and meeting location. $20, or $10 for PHA members. Thursday, Aug 23, 4:30 pm, at the Tisbury Senior Center, VH. “Stewardship of Martha’s Vineyard Waters,” which discusses the problems with coastal ponds on the Cape & Islands and outlines solutions using an ecological approach. For more information, see the press release. Co-sponsored by the Martha’s Vineyard Commission and Tisbury Waterways. The Senior Center is at 34 Pine Tree Rd. Friday, Aug 24, 6:45 pm, Long Point, WT. Guided walking tour for ages five and up begins at the winter entrance to Long Point Wildlife Refuge. Reservations required; space is limited. Cost is $12 for kids ($10 members), with accompanying adults free. Call 508-693-7392 for more info. Wednesday, Aug 29, 7:30pm, at the Arboretum. The timing of leaf out in the spring and leaf fall in autumn is being studied by scientists looking at the effects of a changing climate. Learn more about the study of leaf phenology from Professor Richard Primack in this illustrated talk. $10/$5 for PHA members. For more on the subject, see Dr. Primack’s op-ed Early Bloomers. Thanks to all who came out last week to support the MV Ag Society and check out the educational display from VCS, which won this year's special Michael Wild Memorial Award*. 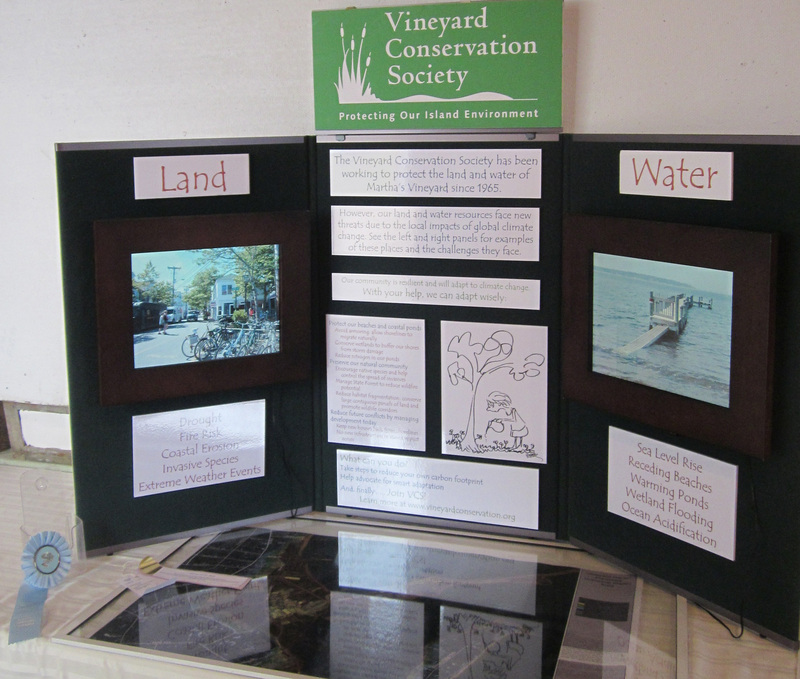 Centered around a theme of how climate change threatens Island resources, the display featured photos of iconic Vineyard landscapes and infrastructure along with a SLOSH (Sea, Lake, and Overland Surges from Hurricanes) map, created by Chris Seidel of the MVC, that reveals which areas of downtown Vineyard Haven would be inundated under various hurricane strengths. * The award is given in memory of fearless and dedicated Island advocate Michael Wild, who was a leader on many environmental issues and projects, including recycling, smart development, and sustainable fishing and farming. It's worth noting that the melting of sea ice poses little direct threat to human interests: this is ice that is already floating in water, so its melting doesn't cause global sea levels to rise much, at least compared to melting land-based glaciers. But, aside from the fact that any observation of faster-than-expected melting is an ominous sign, the loss of ice creates a dangerous feedback mechanism: ice is more reflective than water, so an Arctic Ocean without ice cover will absorb more heat from the sun. This will lead to more overall global warming - and, unlike melting sea ice, thermal expansion of water as it warms does contribute significantly to sea level rise.